Epoxy is a type of polymer material that begins as a liquid and is converted to a solid state through a controlled chemical reaction. Because of this change in state, epoxy floor coatings are typically a mechanically strong and chemically resistant type of flooring. Epoxy floor coatings are highly adhesive during the conversion from liquid to solid allowing them to create a secure bond with both new and old concrete flooring surfaces. There are a wide variety of applications and uses for epoxy coatings including epoxy floor paint in commercial and industrial settings as well as for coatings on industrial equipment or machinery. Epoxy floor coatings can also be used as vapor barriers over concrete slabs and foundations in new construction. 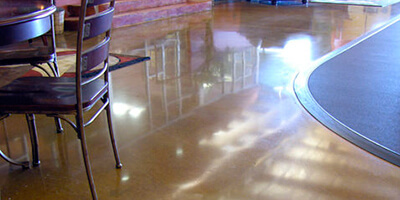 Epoxy floor coatings are typically comprised of two main components, resins and hardeners. 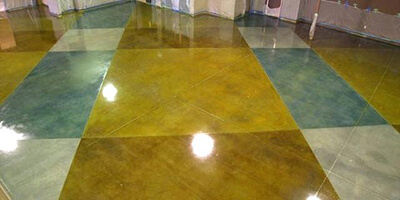 The resin component in an epoxy floor coating is light or clear in color and nearly odor free. Hardeners on the other hand, are dark and have a strong characteristic “ammonia-like” smell. When these two components are mixed together during the epoxy floor coating application process, a chemical reaction begins. This chemical reaction turns the epoxy floor coatings into tough, rigid, and plastic-like materials, which are very durable, waterproof, and chemically resistant. In general, epoxy floor coatings are available in both one coat and two coat varieties. One-coat application systems allow for faster installation times, while two-coat systems result in a more secure application. Two-coat epoxy floor coatings help to eliminate the risk of developing pinholes or voids during application, which can cause future problems in the durability and waterproofing of the coating. The epoxy floor coating process is typically done by applying the coatings using a roller. This application is best when performed by experienced floor coating professionals to ensure proper application and durability. Epoxy Floor Paint Application: Our epoxy floor paint application services include the installation of a high performance, 2-part epoxy floor coating compound. This floor coating results in a high gloss, hard wearing, and durable surface ideal for use over concrete floors in commercial and industrial buildings. Liquid Epoxy Vapor Barrier Application: We offer the application of specialized epoxy floor coatings designed for use as vapor barriers. These liquid moisture barriers can prevent vapor emissions during fast track construction projects and can also prevent moisture from penetrating the flooring and causing mold problems in the future. Our vapor barrier installation services use 2-part liquid epoxy floor coatings designed especially for covering concrete floors. In addition to being useful as floor coatings or vapor barriers, today, epoxy coatings can be used for a wide variety of purposes such as for adhesives, metal and corrosion resistant coatings, electrical systems components, and a variety of automotive and marine applications. Epoxy coatings and epoxy floor coatings are popular because of their excellent adhesion, chemical and heat resistance, good-to-excellent mechanical properties, and very good electrical insulating properties. Learn more about Epoxy Coating Uses or Types of Epoxy Coatings.